eat, drink & be vegan: Veg News Awards - Wanna Vote?! 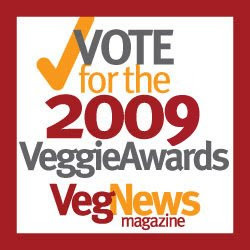 Veg News Awards - Wanna Vote?! The polls open today, July 1st at 9am PST, and when you vote, you have a chance to win prizes including a Tropical Vacation Getaway (I could use this myself right now, ha! ), a His/Her Urban Goodie Bag, a Vegan Ice Cream Starter Kit, and a Chocolate Madness Gift Box. I've been nominated other years, and with the huge competition every year, really I don't expect winning, but wow it would be super cool if I did! So, if you want to send me your votes, please do! My vote's in for you! =) Keep up the good posts and thanks! Voted for you in both categories. thanks to you both... and here's hoping there's a few more votes cast than your two. ;) hee! Did I miss the recipe? The picture looks really good.